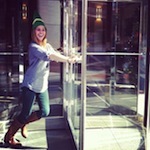 Birmingham-based ad agency Luckie has created a holiday site, Luckie Elf, and will donate $25 to children's charities each time a person Instagrams a photo of themselves re-enacting a scene from the movie Elf. For inspiration, the agency has chosen and described 14 scenes from the film for visitors to re-enact. Agency employees have already had quite a bit of fun as you can see from their own re-enactments.